To us this is false economy, because with the correct selection of the conveying medium in conjunction with speeds and accumulations, it is, without doubt, the difference between a highly efficient line, and a weak and inefficient bottling or canning line. 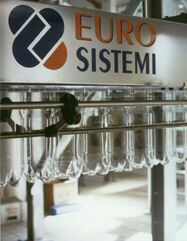 Therefore rather than “conveyors”, Enterprise Tondelli Spa prefer to talk of conveying systems. The conveying system for every line, large or small, slow or fast, low speed high speed, are technically considered by Enterprise Tondelli as all of the other equipment on the line to ensure the best performance and return on the investment. All conveying equipment for the food industry is manufactured predominantly from polished or de-scaled stainless steel apart from the bearings, motors, gearboxes, U.H.M.W.P. wear strips and polyamide castings. 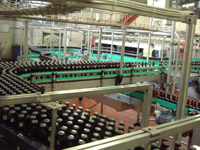 An integral part of the conveyor system is the controls and we design and manufacture our control panels in-house so that we achieve the best results. This is especially important with the pressure less combiners which is PLC controlled for maximum flexibility and also with the automatic change over systems which utilise servo motors. Layouts are prepared in the UK and our manufacturing works in Italy to ensure accurate manufacturing for the site. 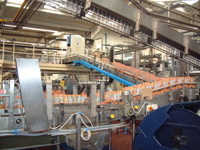 For joined up thinking and professional conveyor project management and interfacing contact Enterprise Tondelli and we would be pleased to show you examples of our work.